I think this explanation of what helps form a good habit is excellent. 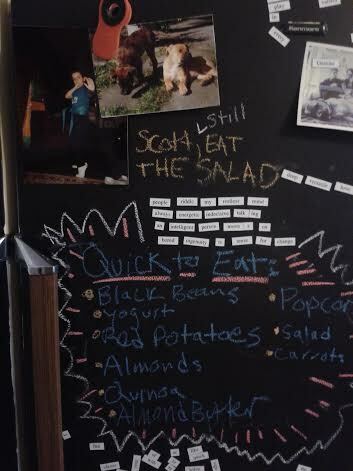 There are many tools and tricks to help make forming good habits successful, and I tool I have found I MUST use is written reminders in places I will see them when I am pondering the problem encompassed by the goal. To the right is an example. The Tool of Success disarms the Internal Agent of Defeat and makes her look silly before she can even finish stating her case. I think there are simple Tools of Success for most arguments the Internal Agent of Defeat can make. What Tools of Success do you use? What is your Internal Agent of Defeat telling you? This entry was posted on February 22, 2014 by Chef Jill in Reaching your Goals and tagged Habit forming, Internal Dialogue, Self-care, Self-defeating, self-sabotage.